This combination of Omega and Salonpas is the Best Muscle Pain Remedy in the World! The Ultimate remedy of Muscle and Joint aches & bruises. Effective against muscle cramps, charley horse, sudden spasms and tightening. Our Hisamitsu Salonpas is the Original Japan Strong Formula. Each order includes two 120ml bottles of Omega Pain Liniments and One pack of Hisamitsu Salonpas, 40 pads in a pack. These remedies are for external use only, apply directly to skin above affected area. 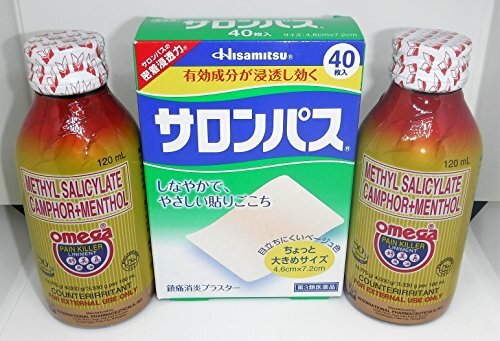 For best results, gently massage affected area while applying Omega, after massage, wipe off excess liniments, apply a pad or two of salonpas, leave salonpas on skin until the remedy takes effect. Omega is made in the Philippines. Hisamitsu Salonpas is made in Japan. Distributed in the USA by Fil-Am Global. The Best Muscle Pain Remedy in the World!